I can’t believe it’s been almost two weeks since we got back from our vacation to Vietnam and Cambodia over Thanksgiving, and the experience was certainly something to be thankful for. As I reflect on our recent journey, I’m so excited to share the different aspects of this vacation experience including the amazing sights, culture, cuisine and accommodations to suit every need and desire. However, it will take a series of newsletters to cover everything, so for today, I will focus on some of the philanthropic opportunities available in this region. I would like to share some of our experiences with the organizations that we participated with, those that we encountered, and so many more that we learned about during our trip. As we prepare for the upcoming holidays, many of us generally participate in supporting charitable causes around the world to make the holidays festive for everyone including those who may not have the means to enjoy holiday gifts and feasts as we do. And we certainly should not lose sight of the opportunties to serve during the holidays in our local communities. We started our journey in Vietnam with a visit to the Birla Village Orphanage in Hanoi. Working with a reputable tour operator with local representatives and guides is essential to ensure that you are not only supporting a legitimate organization with guidelines that are in the best interest of the children, but the visits should be monitored and not disruptive or detrimental in any way to the children. We visited during play time just before lunch and left right after lunch so that we wouldn’t interrupt their nap schedule. As we toured their well maintained facility, we learned about the kids, their daily routine, education opportunities and even learned that the government has strict standards for food preparation which requires the orphanage to keep a sample of each meal served so that the quality and nutrition guidelines can be monitored in order to prevent sickness and ensure proper health for these vulnerable children. In addition to the toys, clothes, and school supplies that we had brought to donate, the tour operator also supplied a box of rice and other items which was their way of thanking the orphanage for allowing us the opportunity to meet the children, have a brief but meaningful interaction with them and most importantly learn about their lives and how they are being raised and supported so that they can flourish and be successful in life. 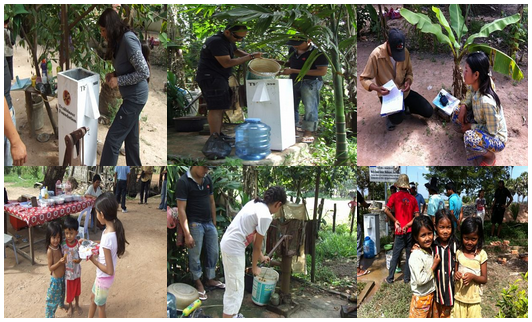 Another project that we had planned into our itinerary was a water filter distribution in a village where wells had already been installed to access the water. The amazing work of the Trailblazer Foundation http://thetrailblazerfoundation.org provides the most basic human need of fresh potable water to drink, bathe and irrigate their fields. 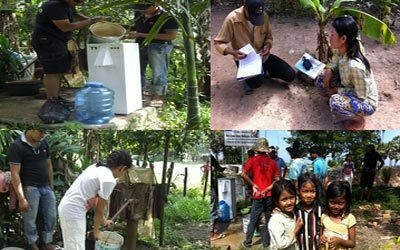 The bio soil filters are a low cost, long term solution alleviating water borne diseases and illness, poverty, and increasing the quality of life for these rural villagers in a sustainable manner. Not only did we learn about how water filters work and the difference they make in people’s lives, but we had an opportunity to participate as a family including our 7 year old who happily shared her cookies and interacted with the local village children. It was a great way to be immersed in their daily lives and to see how they live compared to the way we live. As we visited some of the major tourist sites such as the Pagoda’s in Vietnam and the Angkor Temples in Cambodia, we encountered many opportunities to support the local people trying to make a living with dignity. We hardly encountered anyone begging. The effects of war, agent orange, land mines and the Khmer rouge are visible and heartbreaking. There are countless opportunities to buy items such as CD’s, books, and amazing arts & crafts from Artisan establishments set up to support a huge disabled population in both Vietnam and Cambodia. And these quality items make great souvenirs and gifts to bring home for family and friends. Even the hotels and accommodations we stayed in or just visited provided plenty of subtle opportunity to support the local communities while enjoying their hospitality and service. They hosted local music and dance performances by children from an orphanage to displays of jewelry and art providing funds to local non-profits. Brochure racks included pamphlets for hospitals, orphanages, and a multitude of support organizations some of which I have included links for below. What amazes me the most about our families experiences on this vacation is the fact that we were able to experience a true vacation to a couple of Southeast Asia destinations where we thoroughly enjoyed the sightseeing, architecture, culture, food, luxury accommodations, people who are happy, friendly, and welcoming despite their circumstances, and wonders of the world to UNESCO world heritage sites as you would expect on a typical vacation. 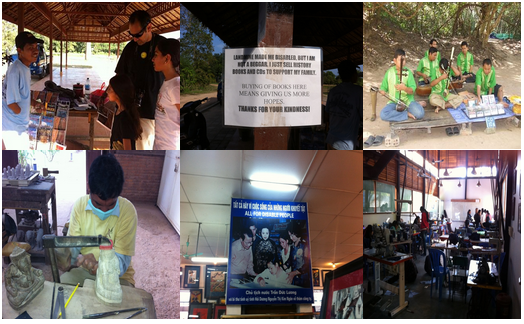 But we were also able to give back in so many ways and came home with inspiration and memories for a lifetime. We truly gained more than we gave. I hope that you and your families have similar opportunities to vacation and experience destinations around the world in such a unique way.